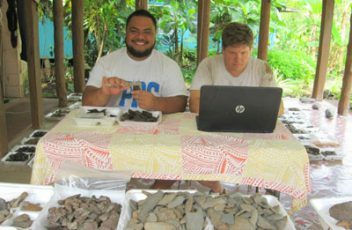 Archaeologists excavate a prehistoric dwelling and retrieve ancient Polynesian stone tools before a building project, to repair damages by a recent tsunami, impacts the archaeological site. October 29, 2012 (Newswire.com) – Directed by Dr. Joel Klenck, a team of archaeologists and volunteers excavated a prehistoric dwelling at Leone retrieving stone tools, pottery, and charred organic remains on the surface of an ancient floor. A series of nine one-meter square units were excavated to a depth of nearly two meters revealing a pavement-like surface comprising flat stones of coral, basalt, and sedimentary rock. The excavation comprised a salvage effort to preserve archaeological remains before the construction of a shoreline revetment, by the U.S. Army Corps of Engineers, at the village of Leone in Tutuila Island. The excavation at Leone was conducted to comply with a federal historic preservation law known as the National Historic Preservation Act of 1966. The Act requires that all federally funded projects take historic and archaeological sites into account by recording and avoiding damage to those sites. The American Samoa Coastal Zone Management Act of 1990 also requires that construction projects in Territory be conducted in a manner to protect historic, cultural, and archaeological sites. By Florence Aetonu-Teo, American Samoa Historic Preservation Office. The focus of DrÃ¶ssler’s manuscript concerns the history of Samoa at the turn of the twentieth century. During this period, Germany, Great Britain, and the United States competed for influence over Polynesian islands. DrÃ¶ssler conducted research in the American Samoa Historic Preservation Office, the Office of Archives and Record Management in Tafuna, the Feliti Barstow Library in Pago Pago and at the American Samoa Community College. From these studies, DrÃ¶ssler obtained correspondence from U.S. Navy officials, missionary reports, letters from Samoan chiefs to U.S. governors as well as numerous photographs at the Polynesian Photo Archives at the Barstow Library. October 29, 2012 (Newswire.com) – Territorial Archaeologist of American Samoa, Dr. Joel Klenck, states a new discovery of ancient pottery in western Tutuila Island has added to archaeological knowledge regarding the distribution of ceramic manufacturing in Polynesia. At the excavation at Fangamalo in American Samoa, archaeologists retrieved an array of artifacts including ceramic sherds at various stages of firing, adzes, basalt debitage, adze preforms, fire-cracked rocks, clays of different color, volcanic glass, small wafer-thin rocks, cinders, ash and other artifacts. A series of one-meter square unit were excavated to a depth of nearly two meters and revealed two layers of features. The archaeology team sponsored by the American Samoan Power Authority (ASPA) and advised by the Historic Preservation Office worked during June, 2012, to complete the excavation and deliver all artifacts to ASPA’s archaeology laboratory for further analysis. Archaeologists Discover Array of Prehistoric Stone Tools in Ancient Polynesian Structure in American Samoa. The nomination was a result of an archaeological survey to comply with the National Historic Preservation Act of 1966. The Act requires that all federally funded projects take historic and archaeological sites into account by recording and avoiding damage to those sites. The American Samoa Coastal Zone Management Act of 1990 also requires that construction projects in Territory be conducted in a manner to protect historic, cultural, and archaeological sites. Archaeologists streamline recording of archaeological sites and historic places and improve responsiveness to government agencies to benefit construction efforts and future research. October 29, 2012 (Newswire.com) – “Creating more efficiency to safeguard the heritage of American Samoa while providing solutions to accomplish new construction projects is our main focus,” states Dr. Joel Klenck, the Territorial Archaeologist of American Samoa. The American Samoa Historic Preservation Office (ASHPO) is responsible for protecting historic and prehistoric sites among the territory’s seven islands. In April of 2012, the ASHPO began implementing strategic process improvements. With the help of an archaeology intern, Ms. Victoria Su’e, all archaeological site forms are being added to a computer database. This data will then be updated and processed through a new archaeology program called ARC GIS 10 that enables researchers to ascertain archaeological features and artifacts throughout the seven islands of American Samoa using satellite data from the Global Positioning System (GPS). Modern animal sacrifice rituals practiced by Bedouin communities in the Levant provide insight to the deposition of remains at archaeological sites in the Near East. Miami, FL — (ReleaseWire) — 03/28/2012 –Harvard University educated archaeologist and president of the Paleontological Research Corporation, Dr. Joel Klenck, conducted an ethnoarchaeological study of modern Bedouin sacrificial practices in the Levant to provide insight on the deposition of remains at ancient cult sites. Ethnoarchaeology comprises the analysis of modern behaviors and the remains left over from these activities. These studies are linked with a concept in archaeology called middle range theory where observations of natural processes or human behaviors are used to explain the deposition of archaeological finds. Deriving his theories from the sociologist Robert Merton, the American archaeologist Lewis Binford strongly encouraged middle range theory and completed ethnographic studies of Australian aborigines, Nunamiut Eskimo and other groups. Binford then compared his data to remains from archaeological sites. Founded in 2007, the Paleontological Research Corporation provides comprehensive worldwide archaeological and paleontological services including surveys, excavations and research. Animal sacrifice rituals performed by Bedouin in the Levant reveal diversity of beliefs. Miami, FL — (ReleaseWire) — 03/26/2012 –Harvard University educated anthropologist and president of the Paleontological Research Corporation, Dr. Joel Klenck, conducted a study of Bedouin sacrificial rituals that reveal a diversity of beliefs in Arab populations in the Levant. Sponsored by a grant from the Joe Alon Museum, Klenck conducted a study of Bedouin sacrificial rituals completed in 2012 and featured in a forthcoming publication. Rarely revealed by Western researchers, Arab pastoral nomads practice several types of sacrificial rituals other than the main feast of sacrifice or “Id al ‘Adha” that occurs the tenth day of the Hadj or “Dhul Hijjah” and is practiced by all observing Muslims. Three other rituals include sacrifices to spirits or “ginn”, ritual slaughters to ward off curses and bless newly married couples, and commemorations to deceased family members. Another type of sacrifice practiced by Bedouin in the Levant comprises sacrifices to a “weli” or revered person. Klenck states, “Bedouin sacrifice sheep, goats, cattle and occasionally a camel to a weli to redeem vows, incur healing, give thanks or insure fertility. Individuals performing the sacrifices believe the weli will act as a mediator between them and Allah to facilitate their requests.”Around 1771, Muhammad Ibn ‘Abd al-Wahhab, a cleric who traveled throughout Saudi Arabia and Iraq, began to influence the ruler of Dara’iya, Muhammad Ibn Sa’ud, whose tribe created the Kingdom of Saudi Arabia in 1932. The religious leader al-Wahhab formed a movement that denounced Bedouin believing in the special powers of a weli, punished individuals performing sacrificial rituals to these revered persons and largely eradicated these practices. Archaeologists excavate a donkey burial from the Middle Bronze IIB period (1,750-1,650 B.C.) in the Levant and discover the earliest reported equestrian bit. Miami, FL — (SBWIRE) — 03/19/2012 — Archaeologists led by Professor Eliezer Oren from Ben Gurion University excavated an equid burial at Tel-Haror, an archaeological site located in the Levant with strata dating to the Middle Bronze IIB Period (1,750-1,650 B.C.). Here, archaeologists retrieved the earliest metal equestrian bit. Dr. Joel Klenck, a Harvard University educated archaeologist and president of the Paleontological Research Corporation, who presided over the analysis of the equid remains, states the burial is at the base of a dome-shaped structure. The southeastern wall of the burial edifice is overlaid by a thick mudbrick partition that surrounds a nearby temple complex. An archaeologist specializing in the analysis of faunal remains, Klenck notes the equid is a donkey as evidenced by foot bone measurements and traits on the grinding surfaces of its teeth. In 2011, the skeletal data from the donkey burial was compared to the material assemblage at the site in preparation for a forthcoming manuscript. Archaeologists are increasingly finding remains of horses and donkeys in ancient Near Eastern contexts. The Vulture Stele, dating to the Early Dynastic III period (2,600-2,350 B.C.) in Mesopotamia, portrays an equid pulling a chariot-like vehicle. Various Mesopotamian manuscripts dating to this period mention the horse, donkey, hemione and hybrids such as the mule. From Sumeria, terracotta reliefs from the early second millennium B.C. show equids pulling a chariot and a human riding horseback. Hittite reliefs from the thirteenth century B.C. in modern Turkey show a larger species of equid perhaps a horse pulling a chariot with three soldiers in contrast to smaller equids in Egyptian murals presumably donkeys pulling chariots with only two men. Horse bones were found at Tell el-‘Ajjul in Israel in contexts dated to around 3,400 B.C. and in Turkey at Bogazkoy from the seventeenth century B.C. Archaeologists excavated donkey remains at Tell Brak in Mesopotamia in contexts dating between 2,580 and 2,455 B.C. Egyptian donkey burials dating to Middle Bronze II periods (2,000-1,550 B.C.) include those found at Inshas, Tell el-Farasha, Tell el-Maskhuta, and Tell el-Dab’a. From similar time periods in the Levant, archaeologists excavated donkeys at Tell el-‘Ajjul and Jericho. Archaeologists excavate puppy and corvid remains in a Middle Bronze Age temple complex in the Levant. The cultic significance of why puppies, ravens and crows were dispatched is less clear. Klenck notes several inscriptions that might shed light on the ideological motivations of the inhabitants at Tel Haror. In the Tale of Aqhat retrieved from Ugarit dating to the fourteenth century B.C. the tablet mentions the deity Baal splitting open vultures and interring them in the ground. Other texts dating from the nineteenth to first centuries B.C. mention the use of dogs in conjunction with healing deities such as Gula or Ninisina in Mesopotamia, Asclepius in Greece, Eshmun in Phoenicia and Resheph-Mukal in Phoenician Cyprus. Further, Hittite texts such as the Ritual of Tunnawi mention puppies in rituals for purification, healing and to ward off evil omens. In contexts from the tenth century B.C., dog burials were found in a ramp leading to a temple at Isin in ancient Babylonia.